First Solar's strategy of expanding into new, sustainable solar markets looks like it's paying off. The thin-film solar panel manufacturer and project developer has applied for permits for the $370 million, 162-megawatt Luz del Norte project, according to a filing with Chile’s environmental licensing department. The project will use more than 1.7 million panels, with construction slated to start in June 2014. This project is a result of First Solar's acquisition, earlier this year, of Solar Chile, a five-person Santiago-based solar developer. 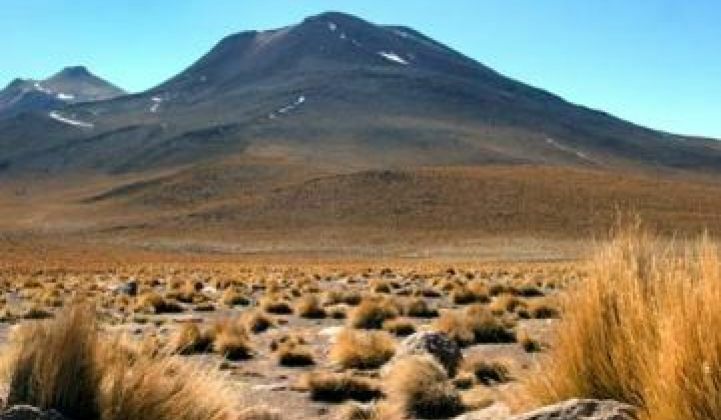 The developer had a 1.5-gigawatt early-stage pipeline of PV power projects in northern Chile, including the Atacama Desert area, a region with some of the highest solar irradiance in the world. Andrew Krulewitz, Solar Analyst at GTM Research, gave us the lowdown: "Solar Chile was born out of the public-private Fundacion Chile, an alliance between the Chilean government and some mining companies, including BHP Billiton, which signed a PPA for a 1-megawatt project with juwi. 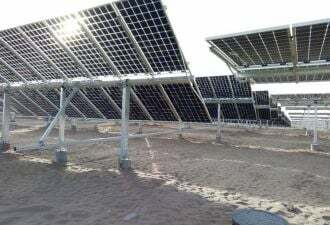 Solar Chile announced an early-stage project pipeline of 1.5 gigawatts, though only the 30.2-megawatt La Tirana project had received environmental permitting as of January 2013." Krulewitz added, "Capital costs for the La Tirana project are $2.50 per watt (DC) according to project documents filed with Chilean authorities." So, absent subsidies, who is going to be purchasing all this power? In an earlier article on utility-scale solar in Chile, we noted that most of the interest has been expressed by the Chilean mining industry, looking to green its footprint and control its own power. 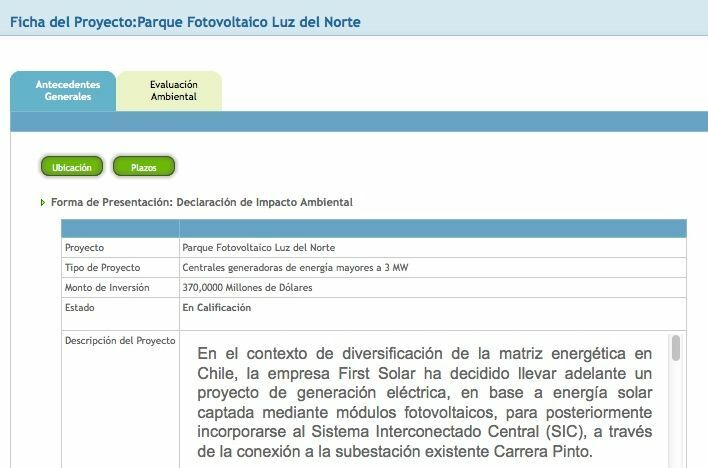 Electricity prices in in Chile hit more than $0.25 per kilowatt-hour on the spot market last year -- potentially making Chile one of the first real, non-incentivized solar markets in the world. A shaky grid and expensive electricity has made Chile an early adopter of energy storage technology in the mining industry, as well. Stephen Lacey took a look at Chilean solar pipelines in his reporting on GTM Research's Latin American solar analysis. He noted that SunEdison signed an agreement with the Chilean mining company CAP to supply electricity from a 100-megawatt plant -- the largest so far in Latin America. These offtake agreements are essential to the financing and eventual construction of a project; despite high spot prices, there is uncertainly surrounding long-term pricing, and financiers are unwilling to participate in such a volatile market. "Many of the small projects that have come on-line in Chile are co-located with the offtaker or are in close proximity," said GTM's Krulewitz. "This allows them to bypass the complicated electricity market, which is highly competitive yet also heavily regulated, including the pricing of electricity." First Solar shipped 370 megawatts in Q1, down sequentially and year-to-year, amounting to a 75 percent factory utilization. Best cost was $0.62 per watt, but the company average was $0.69 per watt. The best line is running at 13.3 percent efficiency, and the company claimed that the best line would be at 14 percent by year-end after incorporating improved back-contact technology. The company provided a 2013 revenue guidance of $3.8 billion to $4.0 billion on shipments between 1.6 gigawatts and 1.8 gigawatts with gross margin between 20 percent and 22 percent. The firm also announced that its manufacturing cost will be $0.63 to $0.66 per watt in 2013 and will plunge to $0.40 per watt by 2017. Less-than-optimally-managed subsidy programs in Spain, Italy, and the Czech Republic have led to booms followed by busts. First Solar has declared its intent to supply sustainable markets, move away from subsidized markets, and to grow its construction projects relative to module sales. This move into Chile is an example of First Solar making good on that promise.